Several issues are key in the medical care of patients with diabetic nephropathy. [20, 21] These include glycemic control, management of hypertension, and reducing dietary salt intake and phosphorus and potassium restriction in advanced cases. A meta-analysis from the Cochrane Database shows a large fall in blood pressure with salt restriction, similar to that of single-drug therapy. All diabetic patients should consider reducing salt intake at least to less than 5-6 g/d, in keeping with current recommendations for the general population, and may benefit from lowering salt intake to even lower levels. Reducing dietary salt intake may help slow progression of diabetic kidney disease. Renal replacement therapy may be necessary in patients with end-stage renal disease (ESRD). In persons with either type 1 or type 2 diabetes mellitus (DM), hyperglycemia has been shown to be a major determinant of the progression of diabetic nephropathy. The evidence is best reported for type 1 DM. It has been shown that intensive therapy can partially reverse glomerular hypertrophy and hyperfiltration, delay the development of microalbuminuria, and stabilize or even reverse microalbuminuria. Results from pancreatic transplant recipients in whom true euglycemia is restored suggest that strict glycemic and metabolic control may slow the progression rate of progressive renal injury even after overt dipstick-positive proteinuria has developed. The dipeptidyl peptidase (DPP)–4 inhibitors (ie, gliptins) are a new class of antidiabetic agents that can be used in type 2 diabetes. These agents include sitagliptin, saxagliptin, linagliptin, and alogliptin, and they decrease the breakdown of the incretin hormones such as glucagonlike peptide 1 (GLP-1). GLP-1 is secreted by the GI tract in response to food intake and leads to insulin secretion in a glucose-dependent manner, while also decreasing glucagon release. GLP-1 also slows gastric emptying. The starting dose for saxagliptin is 2.5-5 mg daily in patients with an eGFR greater than 50 mL/min, but dose adjustment is recommended in patients with an eGFR of 50 mL/min/1.73 m2 or less to 2.5 mg daily. Alogliptin also requires a dose reduction from 25 mg daily to 12.5 mg daily in patients with an eGFR of less than 60 mL/min/1.73 m2 and to 6.25 mg daily if the eGFR is less than 30 mL/min/1.73 m2. Alpha-glucosidase inhibitors (acarbose, miglitol) decrease the breakdown of oligosaccharides and disaccharides in the small intestine, slowing the absorption of glucose after a meal. The major adverse effects are bloating, flatulence, and abdominal cramping. Acarbose is minimally absorbed, with less than 2% of the drug and active metabolites present in the urine. However, in patients with reduced renal function, serum levels of acarbose and metabolites are significantly higher. Miglitol has greater systemic absorption with greater than 95% renal excretion. It is recommended that miglitol be avoided if the GFR is less than 25 mL/min/1.73 m2. These drugs have not been studied in patients with advanced kidney disease, and their use should be avoided in this population. There are several SGLT2 inhibitors under development or consideration by the US Food and Drug Administration (FDA), and canagliflozin (Invokana) is the first SGLT2 inhibitor approved for use in the United States. Canagliflozin inhibits renal glucose absorption in the proximal tubule, the site in the kidney where approximately 90% of glucose reabsorption occurs. This leads to increased excretion of glucose in the urine, which may help subjects lose up to 5 kg of weight over a year. The decreased glucose reabsorption is also accompanied by increased urinary excretion of sodium, which, in turn, may help with further blood pressure lowering, which could be an advantage in patients with diabetic kidney disease and hypertension. Although disputed, there are cases of acute renal failure associated with exenatide, and it is recommended to be used with caution in patients with a GFR of 30-50 mL/min and not be used at all if the eGFR is less than 30 mL/min. Liraglutide is not metabolized by the kidney, and no dose adjustment is necessary in patients with a decreased GFR, including ESRD, although data in this population are limited. Cases of acute renal failure and worsening of chronic renal impairment have been reported with liraglutide, and the manufacturer advises caution in initiating or increasing the dose in patients with kidney disease. Amylin is a 37-amino acid peptide co-secreted by β cells with insulin and is deficient in diabetes. Its levels parallel insulin levels, and its actions are complementary to insulin in regulating plasma glucose concentration. Amylin slows gastric emptying, reduces postprandial glucagon, and can suppress appetite. In general, antihypertensive therapy, irrespective of the agent used, slows the development of diabetic glomerulopathy. Mogensen showed that antihypertensive treatment attenuates the rate of decline in renal function in patients who have type 1 DM, hypertension, and proteinuria. This is particularly significant when lowering of systemic blood pressure is accompanied with concomitant lessening of glomerular capillary pressure. From a therapeutic standpoint, preventing the progression of kidney disease is better achieved with a nonglycemic intervention, such as treatment with angiotensin-converting enzyme (ACE) inhibitors, which confer superior long-term protection even in comparison with triple therapy with reserpine, hydralazine, and hydrochlorothiazide or a calcium channel blocker (nifedipine). Long-term treatment with ACE inhibitors, usually combined with diuretics, reduces blood pressure and albuminuria and protects kidney function in patients with hypertension, type 1 DM, and nephropathy. Beneficial effects on kidney function have also been reported in patients with normotension, type 1 DM, and nephropathy. ACE inhibition has been shown to delay the development of diabetic nephropathy. In the ACE inhibition arm of a large trial, only 7% of patients with microalbuminuria experienced progression to overt nephropathy; however, in the placebo-treated group, 21% of patients experienced progression to overt nephropathy. The beneficial effect of ACE inhibition on preventing progression from microalbuminuria to overt diabetic nephropathy is long-lasting (8 y) and is associated with the preservation of a normal glomerular filtration rate (GFR). The impact of ACE inhibition in patients with microalbuminuric type 2 DM has also been evaluated. Treatment with an ACE inhibitor for 12 months has significantly reduced mean arterial blood pressure and the urinary albumin excretion rate in type 2 DM patients who have microalbuminuria. In a study of normotensive patients with microalbuminuric type 2 DM who received enalapril or placebo for 5 years, 12% of those in the actively treated group experienced diabetic nephropathy, with a rate of decline in kidney function of 13%, and 42% of those in the placebo group experienced nephropathy. Meta-analysis has shown that ACE inhibitors are superior to beta-blockers, diuretics, and calcium channel blockers in reducing urinary albumin excretion in normotensive and hypertensive type 1 and type 2 DM patients. This superiority is pronounced in the normotensive state, whereas it is diminished progressively with progressive blood pressure reduction. Reduced glomerular capillary hydraulic pressure in combination with diminished size- and charge-selective properties of the glomerular capillary membrane are the most likely mechanisms involved in the antiproteinuric effect of ACE inhibitors. The antiproteinuric effect of ACE inhibition in patients with diabetic nephropathy varies considerably. Individual differences in the renin-angiotensin system (RAS) may influence this variation. A potential role may exist for an insertion/deletion polymorphism of the ACE gene on this early antiproteinuric responsiveness in young patients with hypertension and type 1 DM who have developed diabetic nephropathy. In addition to beneficial cardiovascular effects, ACE inhibition has also been demonstrated to have a significant beneficial effect on the progression of diabetic retinopathy and on the development of proliferative retinopathy. RAS inhibition is effective in treating type 1 and type 2 diabetic nephropathy. It is important to consider type 2 diabetic nephropathy separately from type 1, as there are significant differences between them. Both are characterized by the appearance of microalbuminuria, which leads to overt proteinuria and progressive loss of GFR. A series of renal biopsy samples from patients with type 2 DM and proteinuria revealed that a significant proportion of these patients had glomerular lesions other than the classic lesions associated with type 1 diabetic nephropathy. ACE inhibitors reduce the risk of progression of overt type 1 diabetic nephropathy to end-stage renal disease (ESRD) and in type 1 patients with microalbuminuria to overt nephropathy. Although ACE inhibition improves glomerular permeability in patients with type 1 DM as assessed by dextran clearances, it does not do so in patients with type 2 DM. Furthermore, the superior effect of blockade of the RAS has been difficult to prove. Two studies (the Reduction of Endpoints in NIDDM with the Angiotensin II Antagonist Losartan [RENAAL] Study and the Irbesartan Diabetic Nephropathy Trial [IDNT]) demonstrated that angiotensin II receptor blockers (ARBs) are superior to conventional therapy and amlodipine in slowing the progression of overt nephropathy. These trials were performed with ARBs and not ACE inhibitors. This raised the question as to whether such beneficial results in patients with type 2 DM would be seen with ACE inhibitors as well. Unfortunately, a large head-to-head comparison of ACE inhibitors and ARBs is unlikely to be made. However, the recent Nephron-D trial, which evaluated the effect of adding losartan, an ARB, to the ACE inhibitor lisinopril on albumin-to-creatinine ratio in 1448 patients with type 2 diabetes was stopped early because of safety concerns. Combination therapy significantly increased the risk of hyperkalemia and acute kidney injury. Thus, the combination should be avoided as a strategy to reduce proteinuria with the hope of slowing progression of diabetic nephropathy, and should be reserved for individual situations in which optimal control of blood pressure may require it. Until further studies shed additional light, for antiproteinuric effect, the addition of an aldosterone antagonist (ie, spironolactone) may be more effective. In a small double-blind, randomized, crossover trial, Persson et al observed the combination of aliskiren and irbesartan to be more antiproteinuric in type 2 diabetes mellitus than was monotherapy with either drug. This study assessed the effect of aliskiren, a direct renin inhibitor, on proteinuria in patients with type 2 DM (n = 26) and compared the effect with that of placebo, irbesartan (an ARB), and the combination of aliskiren and irbesartan. Patients were assigned to four 2-month treatments in random order. Monotherapy with either aliskiren or irbesartan significantly improved albuminuria when compared with placebo. Combination therapy with aliskiren and irbesartan reduced albuminuria by 71%, more than did either monotherapy (aliskiren monotherapy 48%; irbesartan monotherapy 58%). Use of direct renin inhibitors with ARBs or ACEIs is no longer recommended. This after the FDA issued an advisory in April 2012 based on deliterios serious side effects when such combinations were used. Endothelin antagonists have demonstrated antifibrotic, anti-inflammatory, and antiproteinuric effects in experimental studies. As for any other patient with ESRD, diabetic patients with ESRD can be offered renal replacement therapy. Carefully explain the therapeutic options and modalities of renal replacement therapy to patients, their partners, and their families in an early stage of renal failure. In chronically ill patients with diabetes, this tends to be much more important than in those renal patients who do not have diabetes. In patients with diabetic nephropathy, starting at a creatinine clearance or estimated GFR of 10-15 mL/min is wise. In diabetic patients, starting earlier is useful when hypervolemia renders blood pressure uncontrollable, when the patient experiences anorexia and cachexia or other uremic symptoms, and when severe vomiting is the combined result of uremia and gastroparesis. Dialysis treatment partially reverses insulin resistance so that insulin requirements are often reduced. Adequate control of glycemia is important to prevent hyperglycemia-induced thirst, which can lead to volume overload and hyperkalemia. Proper attention must be given to optimizing nutrition, correcting anemia, controlling hypertension and hyperlipidemia, and modifying associated cardiovascular risk factors. Regarding peritoneal dialysis, in a recently completed study, female patients with diabetes mellitus had a better outcome in the first 3 years of requiring renal replacement therapy when they chose peritoneal dialysis over hemodialysis. This positive effect did not continue beyond 3 years. Except in patients with severe macroangiopathic complications, renal transplantation should be considered a first-line objective because it offers the best degree of medical rehabilitation in patients with uremia and diabetes. This option must be discussed early on with the patient and his or her family. Transplantation even before dialysis (preemptive transplantation) is becoming increasingly popular in some centers. Renal transplantation is generally restricted to younger patients with type 1 DM; this may not be completely justified because good results have also been achieved in patients with type 2 DM if high-risk patients with macrovascular disease are excluded. Because of higher cardiovascular mortality, long-term survival of patients with diabetes with renal allografts is definitely inferior to that of those without diabetes. The major rationale for combined kidney and pancreas transplantation is the increased quality of life and, probably, (controversial) halting or even reversing diabetic complications. Transplantation of the more immunogenic pancreas appears to have a higher risk of biopsy-proven acute kidney graft rejection episodes, but the 1-year graft and patient survival rates are not different from those in patients who had kidney transplantation alone. In patients with type 1 DM, pancreas transplantation is the only treatment that consistently achieves insulin independence. Recently, successful reports of islet cell transplantation have been presented. Indications for pancreas transplantation in nonuremic patients have not been established. Generally, it is offered to patients with extremely brittle diabetes and documented episodes of hypoglycemia without preceding symptoms. In patients with type 1 DM and renal insufficiency, the following 2 options exist: (1) simultaneous kidney and pancreas transplantation and (2) first kidney and then pancreas transplantation (the latter is usually performed when patients receive a live donor graft). A meta-analysis examining the effects of dietary protein restriction (0.5-0.85 g/kg/d) in diabetic patients suggested a beneficial effect on the GFR, creatinine clearance, and albuminuria. However, a large, long-term prospective study is needed to establish the safety, efficacy, and compliance with protein restriction in diabetic patients with nephropathy. Limitations include ensuring compliance by patients. The American Diabetic Association suggests diets of various energy intake (caloric values), depending on the patient. With advancing renal disease, protein restriction of as much as 0.8-1 g/kg/d may retard the progression of nephropathy. When nephropathy is advanced, the diet should reflect the need for phosphorus and potassium restriction, with the use of phosphate binders. A meta-analysis from the Cochrane Renal Group revealed that dietary salt reduction significantly reduced blood pressure (BP) in individuals with type 1 or type 2 diabetes. These findings, along with other evidence relating salt intake to BP and albuminuria in hypertensive and normotensive patients, make a strong case for a reduction in salt intake among patients with diabetes. The recommendation for the general population in public health guidelines is less than 5-6 g/d. Dietary salt reduction may help slow progression of kidney disease in both type 1 and type 2 diabetes. No restriction in activity is necessary for persons with diabetic nephropathy, unless warranted by other associated complications of diabetes, such as associated coronary disease or peripheral vascular disease. Efforts should be made to modify and/or treat associated risk factors such as hyperlipidemia, smoking, and hypertension. Regular outpatient follow-up is key in managing diabetic nephropathy successfully. Regular annual urinalysis is recommended for screening for microalbuminuria (see the image below). Ensuring optimal glucose control, optimizing blood pressure, and screening for other associated complications of diabetes (eg, retinopathy, diabetic foot, cardiovascular disease) are also crucial. Renal complications of diabetic nephropathy include increased risk of urinary tract infections, which may be further increased with the use of SGLT2 inhibitors. Serum electrolyte, water, and acid-base complications are also more common in patients with diabetic nephropathy. For example, type 4 (hyperkalemic, low–anion gap) renal tubular acidosis is more common in patients with type 2 DM, especially those with moderate renal insufficiency, and is associated with decreased ammoniagenesis. Zhang J, Wang Y, Li L, et al. Diabetic retinopathy may predict the renal outcomes of patients with diabetic nephropathy. Ren Fail. 2018 Nov. 40 (1):243-51. [Medline]. Jiang R, Law E, Zhou Z, Yang H, Wu EQ, Seifeldin R. Clinical Trajectories, Healthcare Resource Use, and Costs of Diabetic Nephropathy Among Patients with Type 2 Diabetes: A Latent Class Analysis. Diabetes Ther. 2018 Mar 29. [Medline]. Bjornstad P, Cherney D, Maahs DM. Early diabetic nephropathy in type 1 diabetes: new insights. 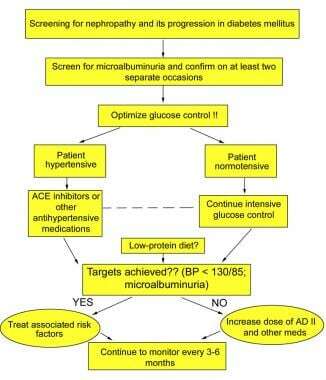 Curr Opin Endocrinol Diabetes Obes. 2014 Aug. 21 (4):279-86. [Medline]. [Full Text]. Rate of decline in glomerular filtration rate in various stages of type 1 and type 2 diabetes. Simple schema for the pathogenesis of diabetic nephropathy. Stages in the development of diabetic nephropathy.